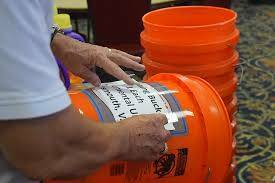 GALION — St. Paul United Methodist Church, located at the corner of Cherry Street and Portland Way South, is launching the second annual Fall Flood Bucket Drive. It started Sept. 22 and runs through Oct. 30. Parts of our country are again experiencing devastating weather that is impacting our fellow Americans. The Flood Bucket Drive is one way to help people in extreme need. One hundred percent of the supplies donated goes to people in need. Sending Flood Buckets filled with cleaning supplies lets others know that they are cared about and that there is hope. Please stop by St. Paul United Methodist Church to pick up a Flood Bucket Cleaning Kit supply list. Supply donations can be dropped at the church between the hours of 9 a.m. and noon Monday through Friday Members of St.Paul will ensure that the supplies are properly divided and placed into the Flood Buckets.